There are two things that I like especially about Thomas Medvetz’s recent book, “Think Tanks in America” (University of Chicago Press 2012). Having spent most of my professional life working in this field, my first reason seems self-serving: I appreciate authors who conclude that “think tanks exert a tremendous amount of influence on the way citizens and lawmakers perceive the world.” Proof that I have not wasted my life! The other is more relevant: Think tanks seldom publish self-criticism or objective studies about their own operations. The few donors who analyze their grantees rarely share the results. This is especially the case if the projects or think tanks they supported were not successful. There are very few independent studies focusing on the history and operations of specific think tanks. One exception is the case study conducted by Harvard University which analyzes the first 10 years of thePioneer Institute, in Boston, Massachusetts. “Think Tanks in America” analyzes several leading organizations, and even those who disagree with several of his arguments—like me—can still learn from it. I recently reviewed in this column “Masters of the Universe” by Stedman Jones. He credits think tanks for playing a role in creating a consensus favorable to market economics. Stedman Jones argues that there was a big dose of luck, and set of circumstances, which led to the “Thatcher–Reagan” revolution. Medvetz, however, gives more credit to the strategy and forces behind the think tanks for their influence and growth. He pays special attention to the special space that think tanks occupy in America. According to the author, the growth of think tanks crowded out truly independent academic research, and he gives four main reasons why: 1) the economy is controlled by large holders of capital; 2) there is an imposition of market forces and jargon through the media; 3) universities are behaving more and more as corporations; and 4) the state is withdrawing funding from higher education. His view can’t be more different than the one shared by leaders of market-oriented think tanks. They see an economy dominated more and more by the state, a media that is hostile to market forces, a university that is captured by left-leaning professors, and a continued state presence in higher education. He states that during the 1970s and ’80s part of the success of conservative think tanks was due to “enormous advantages in the receipt of material support from big business, a relative freedom from state repression which sometimes beset think tanks of the left” and the fact that they worked outside the universities. I think that the latter reason carries weight: being outside the universities allowed the think tanks to grow without having to deal with university politics and other constraints. Think tanks continued to grow beyond the ’80s, but donations from corporations are, on average, only 10 percent of the income of conservative and libertarian think tanks. Heritage and Cato receive less than 5 percent from corporations. Medvetz mentions only one case of harassment by the state against a left-leaning think tank (FBI monitoring of the Institute for Policy Studies). That is not sufficient to prove that “harassment” led to weaker, center-left organizations. The book presents broad outlines for a sociological theory of think tanks. I found considerable value in his description of the “space of think tanks” or “a hybrid institutional arena situated at the nexus of the political, academic, economic, and media fields.” Depending on the background of the analysts, many fail to capture the strength and weaknesses of think tanks. Some critics see think tanks as more affordable lobbying firms, low level academic research organizations, aspiring media outlets, or conduits for business and political interests. Medvetz, however, argues that occupying an important role in each of those fields is the secret to their success. The ability to blur the boundaries among fields is the biggest asset of think tanks. The most successful are masters at convincing donors and audiences that they are playing an important mediating role in the social structure. Since Thomas Medvetz completed his research, we have seen new competition for think tanks. More universities and colleges are allowing the growth of policy and research centers. In the area of advocacy, we also witnessed the explosive growth of Americans for Prosperity and FreedomWorks. Both originated from Citizens from a Sound Economy, which is mentioned in the book. 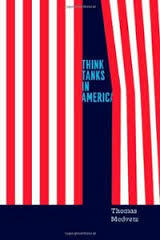 I agree with Medvetz that think tanks have changed America. They will continue to help change, and hopefully protect, the American free enterprise system. Those of us who love the creative power of competition expect that the market will continue to evolve. As it happened in other countries, I expect that some think tanks will turn into universities. They will demand more academic talent, and hopefully, the quality of the policy analysis—as it happens with other products open to competition—will improve, both at think tanks and universities.